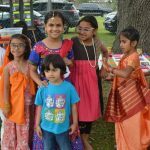 By the immense grace of Sri Swamiji, the Houston GOD chapter conducted a Gopa Kuteeram Youth Summer Camp 2012 for kids aged 8 to 15. The camp was conducted every Wednesday from 2pm to 8pm for six weeks from June 13 to July 25. A total of 18 children attended the camp. 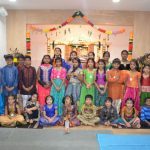 The six week camp came to a colorful close with an enchanting Puppet Show performance by the kids titled “Why Incarnation” a story from Tulasi Dalangal in Akbar-Birbal setting. The kids themselves had written the script, given voice recording and created the background sets for this show. The kids also rendered few of Sri Swamiji’s kirtans that they learnt in the camp during Madhura Gitam sessions conducted by Nalini Sadagopan. 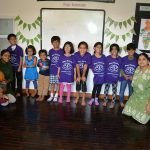 Other highlights of the camp included Photography, Art, Ayurvedic Cooking workshops, Bharata Pradakshina series where the children learned about Mahans from the four corners of India, Games (indoor and outdoor), Nama yoga, Shravana yoga, Exercise yoga, a field trip to museums and more. Several awards including medals and trophies were given out to the children on the final day of the camp. The special workshops were conducted by Ram ji (photography), Mahesh ji (outdoor Indian street games), Ishani Kulkarni (Art), Karuna Diedericks (Ayurvedic cooking). 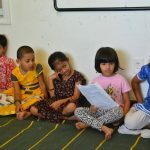 The camp workshops immersed the kids in Indian culture and universal spirituality in a fun filled manner . The children had a great time and the camp organizers received very good feedback from both the parents and the children about the camp. The program concluded with prayer and Arathi at the Houston Namadwaar. 2 Responses to "Gopakuteeram Youth Summer Camp 2012 in Houston"
All Glories to our Guruji, Spreading Haribhakthi all across the world in various forms ! 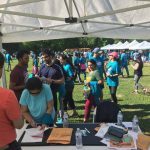 Humble namaskarams to Houston Team for Great Kainkaryam !